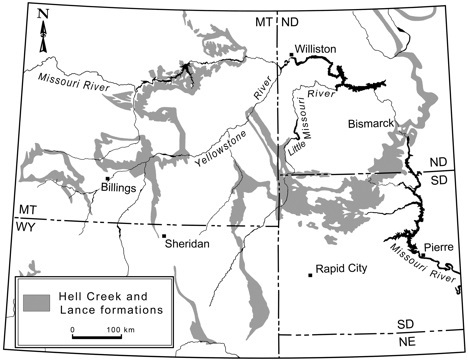 Ankylosaurus fossils have been found in the Hell Creek and Lance formations in Montana, Wyoming, and Alberta, Canada. These areas correspond to the uplands on the western shore of the Western Interior Seaway, where Ankylosaurus is believed to have lived. Osteoderms - mixed with a Tyrannosaurus rex skeletion, and inccorrectly assumed to be part of an armoured Tyrannosaurus relative (" Dynamosaurus imperiosus"). Upper part of skull, two teeth, part of the shoulder girdle, many vertebrae, ribs, and osteoderms. Skull, mandibles, ribs, vertebrae, limb bones, and armor, plus the only tail club found so far.